Director General of the National Telecommunications Commission (NATCOM), Maxwell Massaquoi, has disclosed that his institution has worked closely with the mobile network operators to take sim cards hawkers off the street. Massaquoi, who was speaking yesterday at the usual government press conference in Freetown, said some of the sim cards hawkers were not sanctioned by the Mobile operators to do so. The Director General said his institution was on the verge of reviewing the existing sim cards’ regulation, adding that things that have been changed in contemporary Sierra Leone should now be included in the new regulations. He recalled that on 17th November, 2018, NATCOM mounted an operation that led to the uncovering of sim card fraud and that accused were taken to court. “The computers that the Chinese were using to manufacture those sim cards are now in the possession of NATCOM. We have forensically recovered the database. For those sim cards that belonged to Orange, we realised that a proportion of 941 were never been used and did not carry know your customers (KYCs) identities,” he said. With regards the quality of service, he said NATCOM was in discussion with the operators to ensuring quality of service to customers, noting that because of his institution’s persistent engagement, the quality of mobile network operators has been significantly improved. He said customers should understand two things-ensuring that subscribers have affordable communication services and the investors are not doing charity. Chairman of the Board of Directors of NATCOM, Dr. Prince Harding, said his institution was doing everything to minimise sim card fraud to an acceptable level. “There are some people that want to deprive the nation and we want to ensure that the mobile network operators make their services affordable and efficient. NATCOM encourages fair competition,” he stated. 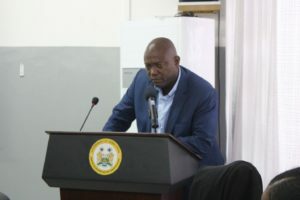 Minister of Information and Communications, Mohamed Rado Swarray, said since the Sierra Leone Cable Limited (SALCAB) has made 48 percent reduction in its tariff, Orange mobile network has been urged and agreed to reduce its tariff to 50 percent. “We engaged the mobile network operators and internet providers to ensure that the reduction that was done by SALCAB is replicated on their tariff. President Bio is strongly interested in rural connectivity and he will stop at nothing to ensure it works for the benefit of all Sierra Leoneans,” he said.